Rockford IceHogs' rookie forward Jack Skille was the Blackhawks' top pick in the 2005 NHL Entry Draft, and is quickly moving up through the organization. 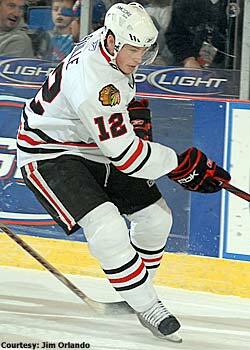 Rockford IceHogs rookie right wing Jack Skille always will remember his NHL debut for the Chicago Blackhawks. In an "I-wish-I-could-forget-it kind of way." It came when the Blackhawks hosted Los Angeles on Dec. 30. Skille, who is from Madison, Wis., had family in the stands. He took his first shift on admittedly wobbly legs and whipped a pass that was intercepted by the Kings' Raitis Ivanans. Skille tried to make up for the gaffe by checking Ivanans, but he missed and fell down in front of the bench. Chicago's Patrick Kane wound up bailing out Skille by calling out his name and jumping on the ice for him. "My little sister has the whole shift on video," said Skille, 20. "She laughs about it. My second shift was better. Then, my third. Then, I hit the crossbar. After I hit the crossbar, I was; 'Oh, I can play in the NHL.' It's a learning experience." Much has been a learning experience for Skille this season, from dealing with the AHL-NHL shuttle to slamming into, and climbing over the rookie wall. Skille's edge is that he tends to pick up things quickly. As a college freshman two seasons ago, he scored 13 goals for NCAA champ Wisconsin. Now, with 10 goals and 12 assists in 42 games for the IceHogs, he's one of the most promising newcomers in the AHL. "I think his progression from September to now has been outstanding," said Rockford coach Mike Haviland. "He's very wide-eyed. He listens to everything you say to him. But he has a confident attitude. You need that in this game. You have to believe in yourself. The whole game is about confidence, and he's got that right now." And why shouldn't he? Skille, the No. 7 overall pick by Chicago in 2005, has made his own breaks, but there's no question he's led a charmed hockey career. He was a college hero in his hometown state, and the Badgers won the championship in Milwaukee's Bradley Center. Chicago is a little more than two hours from his hometown, and Rockford is less than an hour away. Rockford also is a West divisional rival of Milwaukee. When the IceHogs visited the Admirals on Feb. 17, it was Skille's first time in the Bradley Center since he left it with a hunk of hardware. "It was pretty cool," Skille said. "You go out on the ice, you're skating around, the last time you were on that rink you were holding the national championship trophy. I had to take a look around and soak it in again." Right around the same time, Skille was doing another kind of soaking. It helped to rejuvenate his season. Skille had heard all about the rookie wall, especially for players coming out of college. But at a chiseled 6-foot-1, 204 pounds, he figured he had it beat. Right up until what he thinks was maybe his 54th game of the season. That was Feb. 15, when Quad City visited. In the third period, his legs started turning into jelly. "I wasn't winded. I came back to the bench, my whole body was tired," he recalled. "The rest of the game, I had to take 15-second shifts because I had nothing left in my legs. It was the first time in my whole career that I felt that." Skille was OK, except that his body was trying to push itself to another threshold. In two seasons at Wisconsin, he played in 65 games total. Now, he was swallowing that total in a few months. The solution was to back off a bit. Oh yeah, and to plunge himself into arctic cold ice bath treatments after practice. It's pretty bad. After the first two minutes, you get used to it," Skille said. "You have to watch TV, take your mind off it." Skille has a hide resilient enough to withstand cold splashes of water both real and metaphorical. That how he's been able to remain afloat through two recalls and, disappointingly, two send-downs within a six-week span after Christmas. Between the two promotions he squeezed out 16 games with the Blackhawks, posting three goals and two assists. "You just can't let it get to you," he said of the early teases and disappointments. "That's the mental part. It only makes you stronger when you deal with it in a character way. I know personally I can play in the NHL. To say that is a big thing. You can't get so worked up about being sent down." The way Haviland raves about Skille's game, that challenge might soon be off the table. Skille is fearlessly steaming toward the net, Haviland said, an attitude complemented by tremendous speed and a heavy shot. "He's not afraid to go into traffic areas," Haviland said. "He's got a man's body. He can handle the physical side of the game." Just as vital is the way his mental component has rounded into shape, from the ability to laugh at himself and with others to the forging of a steely resolve. It's an edge he can pass on sometime down the road, maybe when he's an NHL vet who gets a fawn-legged rookie as a new teammate. "In the future, when there's a 20-year-old on the team that gets called up, I can give him my advice," Skille said. "I'd tell him, just play. Who cares what you do that first shift? In the game of hockey, you can't worry about things like that. Don't think. You just have to go out and play."